Welcome! Techniform's blog was created to further the discussion of thermoforming while keeping you updated on the latest news on all forms of plastic thermoforming at Techniform and in the industry today. At Techniform we bring your ideas to life - we hope our blog continues that inspiration! Every now and then a project comes along that not only tests the broad capabilities of plastic thermoforming but also manages to be a lot of fun. 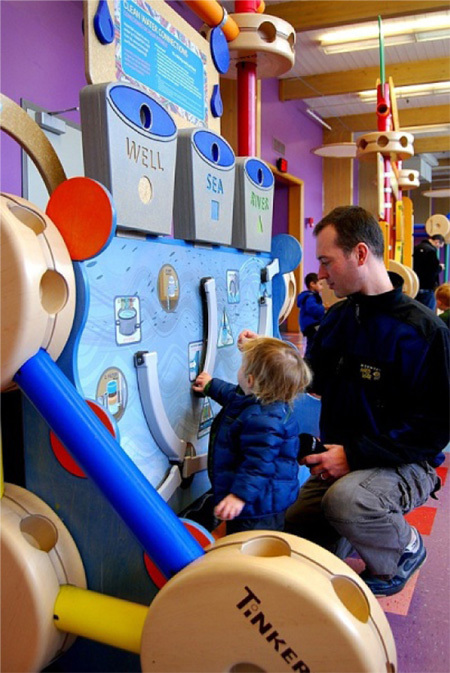 Such a project came along when Techniform was approached by a client representing the Betty Brinn Children ‘s Museum to develop a large scale key component for their TinkerToy exhibit. The required component was a scaled-up representation of the wooden hub used to interconnect the TinkerToy pieces, and fabricating the hubs out of wood was neither practical nor economical. It was determined that plastic vacuum forming was the only logical fabrication process for several key reasons. Firstly, because the product needed to simulate a real wooden hub, a thermoformable wood grain laminate was used to achieve this appearance and this type of decorative laminate can only be formed using thermoforming since the laminate is applied directly to the plastic sheet during the sheet extrusion process. The sheet can then be vacuum formed with the stretchable decorative laminate pre-applied to the sheet. Secondly, since the production volume was relatively low the high tooling costs of other plastic forming processes were not feasible. By choosing vacuum forming, Techniform was able to produce a low-cost epoxy mold to complete the production run and achieve the same high quality appearance on the outside of the part. Another advantage that Techniform brought to this project was its ability to produce tooling without any formal drawing or design by utilizing their in-house wood pattern shop. Although very few thermoformers still maintain pattern shops, Techniform recognizes the continued necessity for such a facility to better service certain types of projects that are better suited for “on the fly” development. Another trade technique used to keep the project tooling costs low was the use of “built-in-rout-guides” (known as BIRGS). This technique utilizes molded-in geometry along the trimmed edges and guides the cutting tool to trim the part from the scrap area. The hub’s structure consists of two vacuum formed pieces glued together which makes up one half of the hub, and then these two assemblies are bonded together as mirror image halves to form a complete hub. This type of design structure – the use of the same part in multiple locations - is yet another technique in vacuum forming utilized to keep the tooling costs low. 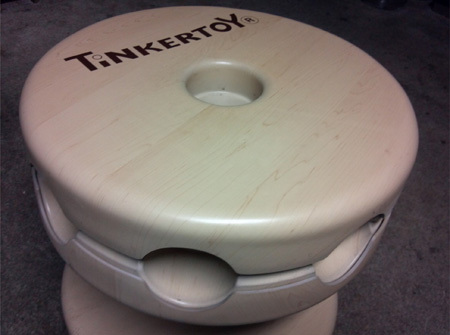 Finally, the Tinker Toy Logo was hot stamp printed onto the hub producing a remarkably realistic large scale replica of the original wood hubs. 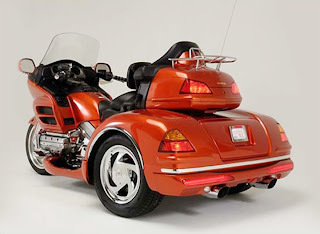 California Sidecar, a 30-year industry leader in motorcycle trike conversion kits, was looking to find ways of cutting costs with a specific focus on the type of materials used to make their conversion kits. Obviously, due to lower volumes and high impact and structural requirements, fiberglass is a choice material for most of the applications on their kits. However, because fiberglass dominated, several components were sourced as fiberglass where plastics were more suitable and economical. One such component was the light bar assembly, a cosmetic rear panel that adds additional LED lights to the conversion kit for style and safety. It was determined that an ABS vacuum form would not only prove to be more economical but also resulted in an easier assembly process and weight elimination. The process of converting the light bars from fiberglass to an ABS thermoformed plastic component required addressing a few design characteristic requirements necessary for the light bar’s function and aesthetics. Firstly, in order to achieve a class-A painted surface on the exterior of the light bar, a female mold would be necessary with a polished surface free of even slight imperfections. Secondly, the opposite ends of the light bars required undercut (or die-lock) features so that the final assembly would show no trimmed edges in order to achieve a high-end appearance. Since the undercut edge geometry was on a curve, hydraulically–controlled indexing details were selected to mold the undercut geometry. These undercut details would then subsequently open up and allow the vacuum form to index from the mold cavity. Due to the mold size and deep-draw geometry a cast aluminum mold proved to be far more economical than an aluminum mold cut from billet. However, given that a CNC-cut surface was necessary to achieve the required finish it was determined to use a Renboard-cut foundry pattern with hand-constructed run out data. A very high quality cast aluminum mold with minimal porosity was developed and the mold surface was benched to perfection. Lastly, during the thermoforming process, a matched surface plug assist is utilized to achieve adequate material distribution and consistency. In the end a very high-end and aesthetically pleasing light bar was introduced to two of their Trike models providing the cost savings they needed while maintaining critical appearance and performance requirements. Learn more at our website http://www.techniform-plastics.com or call us today at 1-800-691-2816 to discuss your next project or get a copy of our capabilities brochure! The founders of Liquid Games, LLC decided to take a popular game called beer pong and develop a better product than was available. Their concept was to take a traditionally boring concept – a standard folding banquet table with little or no graphics on it – and take it to the next level by introducing tracking neon lights, illuminated pockets to light up the cups, and other physical features that also included another popular game known as Flip Cup. The idea was not only to create a more enjoyable gaming table but also to make a table more suitable for bars and nightclubs. Their new table was a wood composite construction with internal LED lights that required hands-on skill in carpentry that they built in their garage woodshop. The new table was an immediate hit, and became a popular traveling fixture at local bars and parties, so they decided to commercially market their new table. Upon publishing their new website they were immediately faced with a problem every retailer loves to have – too many sales, and they immediately knew that they would not be able to keep up with sales by constructing each table out of wood. They needed to find a fabrication process and a company capable of converting the wood-constructed table to a medium-volume manufacturing product that could be produced a cost . . . . Plastic was the obvious choice and vacuum forming was the most advantages process due to low tooling and production costs. Our first meeting involved literally setting up the table in our conference room and saying “How can we build this in plastic?” A comprehensive prototype program was laid out, and we immediately began designing the new generation “Sink and Drink” table. Within a week several designs were evaluated, and a final concept design was agreed upon. Our engineering team generated a solid model CAD assembly that consists of three vacuum formed ABS and clear PETG components and a CNC-cut PVC foam board panel. Upon approval of the concept photorealistic renderings generated from the solid model CAD data, “soft” tooling (wood molds) was produced in Techniform’s in-house tooling shop and first article vacuum formed samples were made. 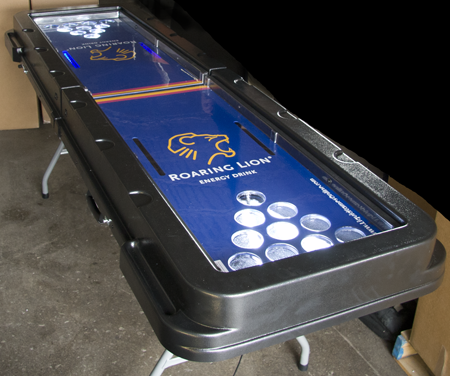 Upon approval of the prototype “Sink and Drink” tables, production temperature controlled aluminum tooling was developed and Liquid Game was able re-launched their website showcasing their new “Sink and Drink” vacuum formed tables within a few months of initializing the development program. The product won “Best Invention of the Americas” at the INPEX New Production and Invention Expo in Pittsburgh, PA, and was also featured on the Tonight Show with Jay Leno. Thermoforming Conversion Case Stories - Technically Speaking! Of the many advantages that plastic thermoforming offers perhaps the most advantageous is the ability to covert products previously produced using other materials into a thermoplastic component more suitable for the application. The reasons for converting products into plastics can range from production economics to performance and aesthetics characteristics. Because thermoform tooling is very inexpensive relative to other plastic fabrication process like injection molding or blow molding and molds can often be developed without CAD data or technical drawings the process of converting to plastics is both economical and fast. In many cases, prototypes can be molded from “soft” tooling (wood or epoxy) that can be produced at a very low cost during a very fast turnaround time – many times within a few days. This keeps the risk factor low and keeps the critical time to market short. 1-800-691-2816 to discuss your next project or get a copy of our capabilities brochure! Experience Works, the nation's largest organization serving older workers through the Senior Community Service Employment Program (SCSEP), named Techniform Industries, Inc. of Fremont, Ohio as the 2011 Ohio Employer Champion. Techniform Industries is recognized for its leadership and commitment to developing strong business partnerships with Experience Works and hiring older workers. Founded in 1972, Techniform Industries is a family owned and operated company that produces custom plastic thermoformed components for a wide variety of industries. With more than half of its employees over the age of 50, Techniform Industries values older workers. "Techniform values older workers and finds them to have a solid work ethic that greatly impacts day-to-day business and its customers," according to Human Resource Manager Wendy Robinette. The company even contracts with several of its retired employees to come back and assist with special projects. "It makes sense," Robinette said. "We value their knowledge and expertise. We know we can depend on them to do the best job possible." Former Experience Works Senior Community Service Employment Program participant Joyce Miller was hired by Techniform Industries as a full-time receptionist. She was unemployed for more than a year before enrolling with Experience Works. It had been two months since she received her last unemployment check. While with EW Joyce trained for five months at the Fremont Job Store where she helped other unemployed Sandusky County residents look for work. At 58 years-old, Joyce is thrilled with her new job and is grateful for the family-friendly atmosphere. Experience Works Ohio State Director Kent Kahn says employers across Ohio have found that hiring older workers makes good business sense. "Older workers are versatile, have excellent skills, a strong work ethic, and are committed to helping their employers succeed. "These highly successful partnerships thrive as a result of the Experience Works SCSEP. Through the program, out of work low-income seniors provide community services at non-profit agencies. While there, the older workers upgrade their skills so they can be competitive in today'sjob market. Employers who recruit SCSEP participants for their job vacancies report high levels of satisfaction with the individuals they hire. Unfortunately, federal budget cuts have decreased the numbers of people who can be helped through the SCSEP and waiting lists are growing. "In the months ahead, we hope that policy makers will recognize the extreme value of the SCSEP and spare it from the chopping block," said Kahn. For more information visit www.experienceworks.org. A custom plastic thermoformer, specializing in vacuum forming, pressure forming, and twin sheet thermoforming of plastics. Our success - and our customers' success - is founded on: Responsiveness to our clients' needs, Unrivaled mastery of thermoforming techniques, Unsurpassed engineering and design expertise to turn your idea into reality.